I am now the proud owner of Unlucky Twist from Oskar van Deventer. The order: 1x2x13. This puzzle is not hard to solve. What make the puzzle so interesting is that when the two main lines separate, the pieces at the ends do not fall off. Look closely at the photo and you'll see that the piece at the end is connected all the way to the center with a telescopic shape. 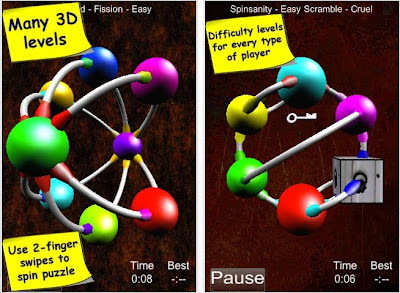 Spins 3D is a very sleek puzzle app authored by Nathan Carter. 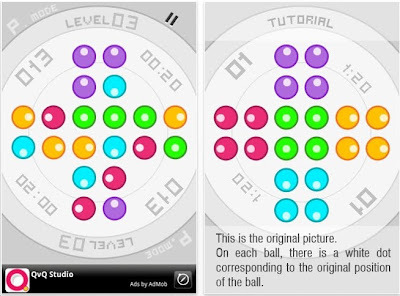 The object is to spin each circle to rotate the positions of the balls. Match the colored balls to the colored spots & you're done. Each puzzle can be solved at different levels of difficulty. 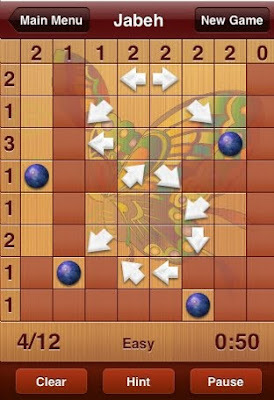 For example, the treasure box needs to be opened with a key to let out the ball. Some balls get itchy. If they are in the correct positions too long, they flee. Overall, I do recommend this puzzle! I downloaded Nadibom in part, because the image seemed silly, but compelling. The object is to get your man to the bomb. 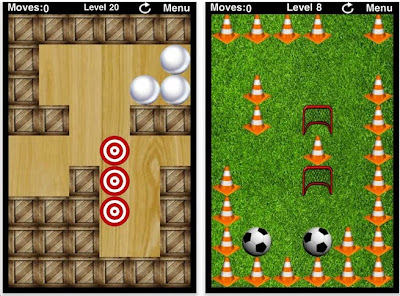 The mazes look simple but The Hero, must push walls inward to get to the closed off paths. However, walls cannot be pushed all the way onto another wall. 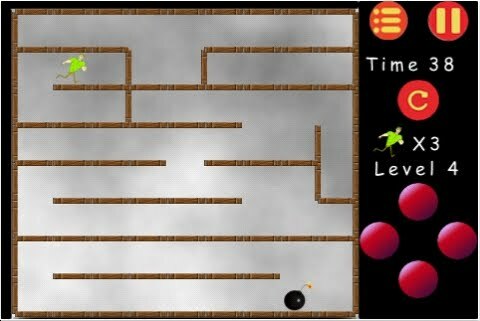 Therefore, your task is to quickly determine a route by finding which walls can and should be pushed before time expires and BOOOOOM!, you die. 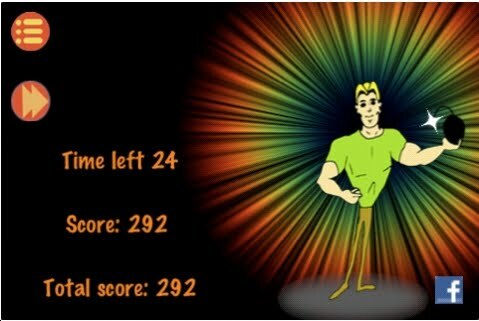 I have managed to get through about 25 levels, before dying. Nadav Solomon is the author. 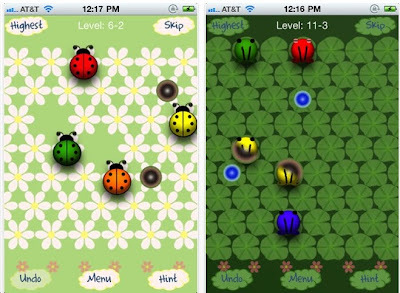 He's working on other puzzle apps too. Download it! Have you played Fling!? If so, you will love Bumpling. The object is to knock the balls off the hexagonal grid until only 1 remains. However, there are wormholes. Also, there are rotating plates: if your man passes over this, it will exit at an angle. I'm not going to mention the 2 important elements of the turn-arounds. Suffice it to say, this is one of those puzzle apps that you keep. Bravo to the Doodle Panda company for making this. For a few minutes I thought to myself, 'Oh no, not another sliding rows and columns puzzle!' Yes and no. For the easy puzzles, it's exactly that. Scroll down through this blog and see similar puzzles. For the harder puzzles: things get more complicated. Some rows are linked with other rows. So, if you slide row 1, row 3 will follow. Same with the columns. Definitely give this a test run. Eui-Hwa Park is the author. Reiner Knizia has produced many high quality great puzzle apps. 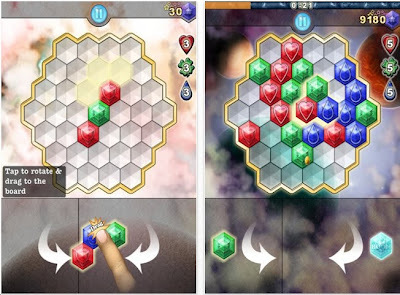 Cluster Master: Fit the hexagons into the grid to make clusters of the same color. Larger groups get more points. This is not quite a puzzle game, but it's entertaining. Download the free version and give it a test run. There are so many very good puzzle apps to play. 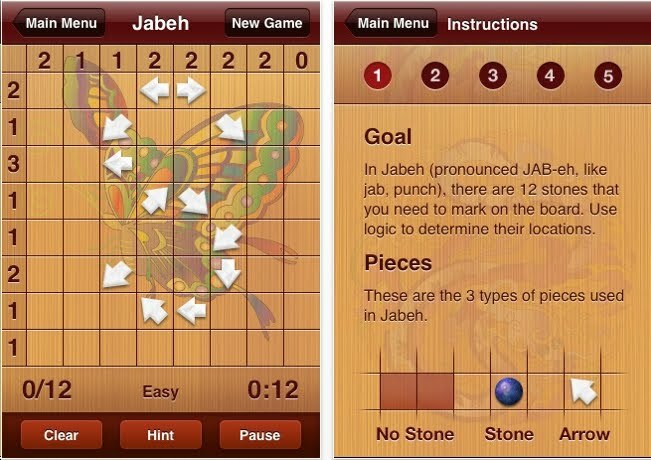 Jabeh is a deceptively great puzzle app. Find the 12 stones in the grid. The numbers on the top indicate how many stones are in that column. The numbers on the left show how many stones are in that row. The arrows point to where a stone must be in that direction, not necessarily next to the arrow. Arash Payan is the author. 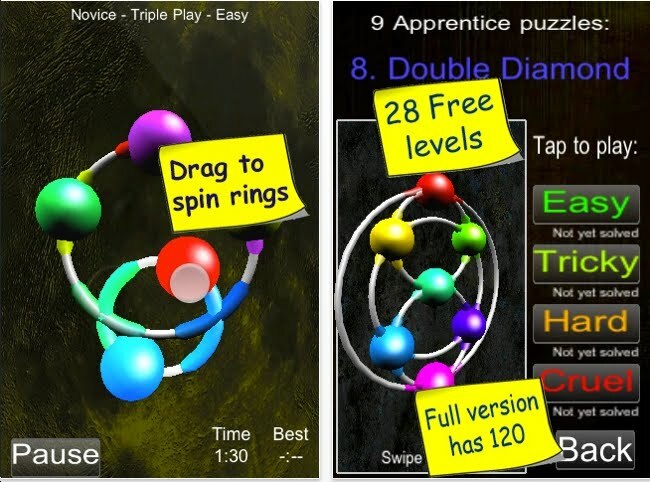 The free version has 50 some levels. 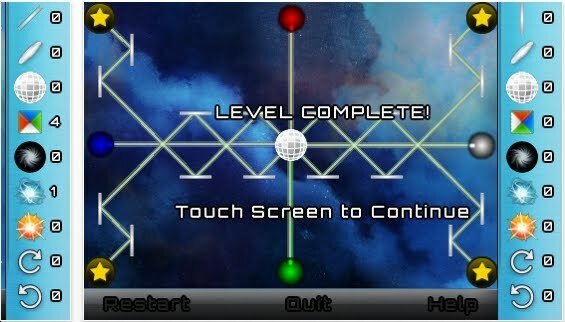 I couldn't stop, until all the levels were solved. The paid version is a bit pricey at $4.99. Bravo Mr. Payan! 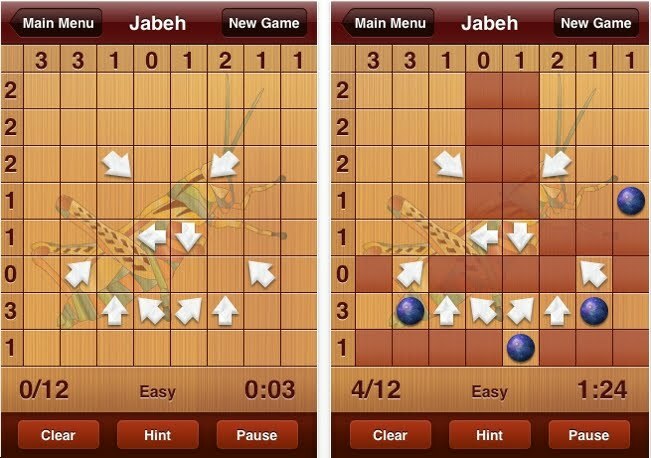 Does the world need another tilt-maze? Not really. However, life is so much richer when a good one comes along. The makers of Boxat are modestly known as Ultimate Team. 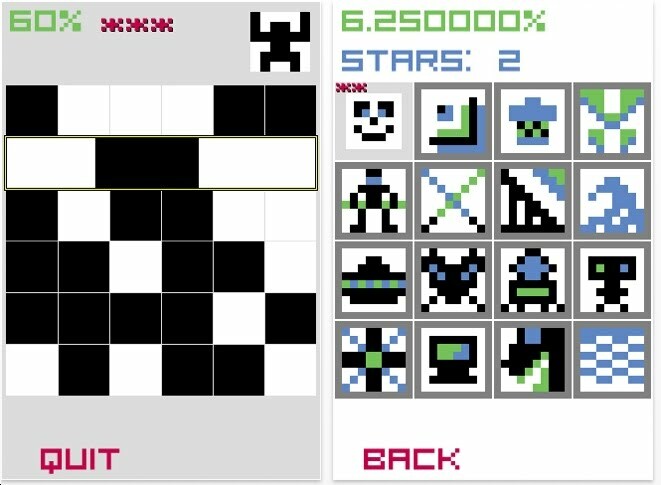 Boxat comes with 100 levels. Some are very difficult. However, this Mechanical Puzzle Correspondent tackled them all. 99 cents gets 2-3 hours entertainment. If you've never done any tilt mazes, this is a good introduction. Then graduate yourself by getting Blockhouse. 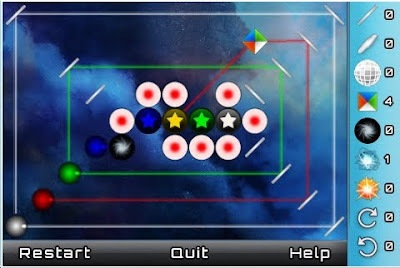 The object of Move It - to move the red square to the upper right corner. 50 levels are free. After that, there are 6 Level Packs to purchase (optional) each having 100 levels. 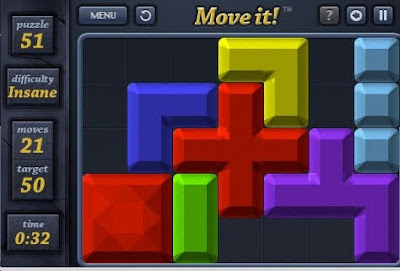 Move It has a sleek feel & is fun. I solved all of the free levels in my doctor's waiting room. If you like Move It, do try Rush Hour & HexSlide too. 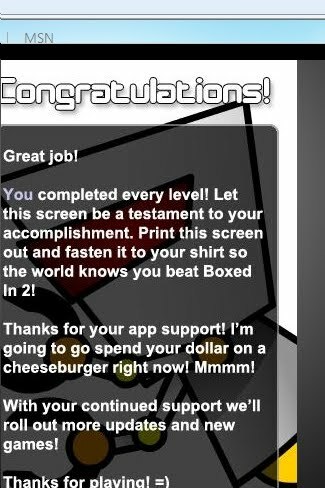 Not all puzzle apps have this little reward for completing all the levels. 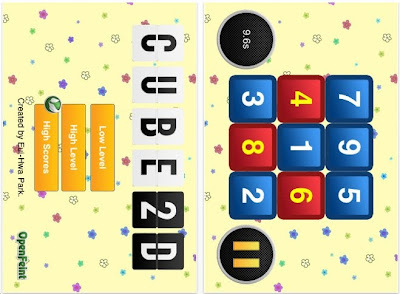 Boxed In 2 consists of 50 sokomind puzzles with a twist. Some of the boxes need to be pushed into corners. 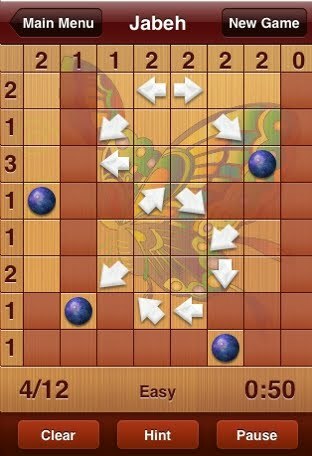 So if you've done many sokomind puzzles, it's difficult to break out of that habit. Here's a colorful puzzle that's very similar to some other puzzles we've reviewed. The object is to slide the horizontal & vertical lines so that the green balls are in the middle, purple on top, etc. It's free, so give it a shot. See the Light has nothing to do with religion. 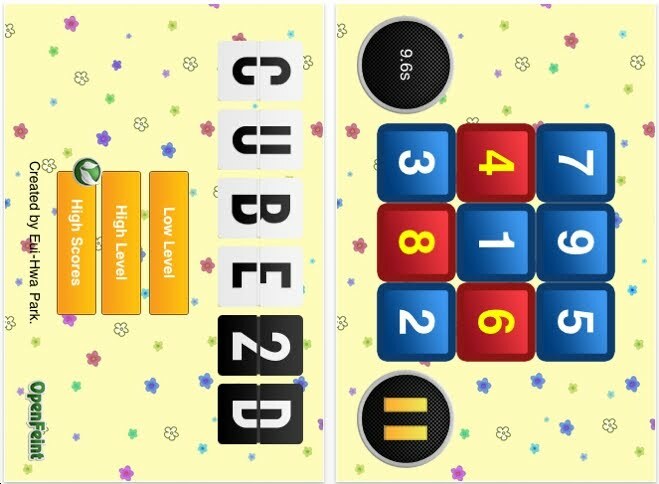 It is a puzzle app. Use mirrors, prisms and lenses, absorbers and other tools to direct the light to the target, thus saving humanity. All in a day's work, right? Brian Sowers has created 80 puzzle levels. Fans of Lumi, Prism (Nintendo DS game) and Slime Lumia will be challenged heartily with the new gadgets. 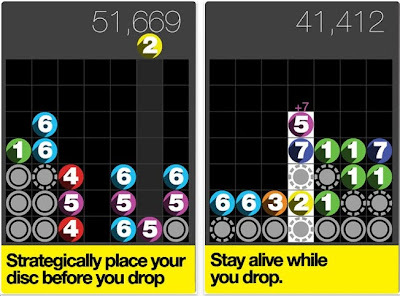 Drop 7 comes from Zynga, the creators of Farmville and Mafia Wars. Drop the numbered discs into the slots strategically. It seems like Tetris, but there is no time constraint. 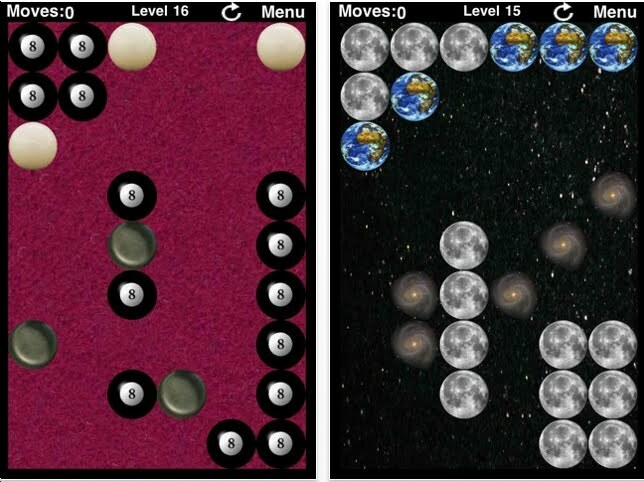 I got through level 11 and scored 69,000 points. But I confess that I don't fully understand the game. In particular, there are some discs that are unnumbered. Actually, their number is hidden. To reveal the number...one must do something - but it's not clear to me. 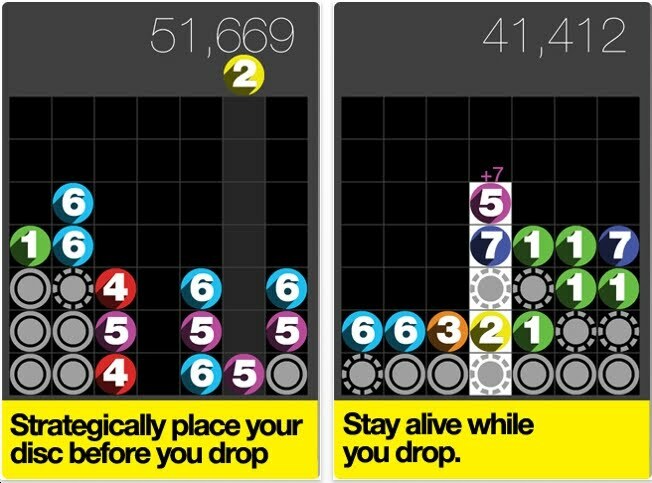 Download Drop 7 for free, play around with it and let me know what you think. This puzzle does not exist as a physical model. 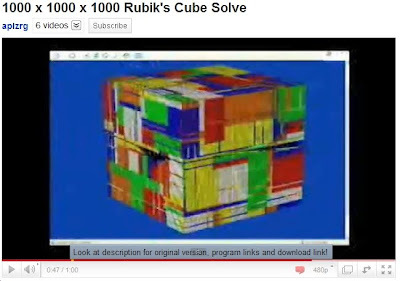 However, it's nice to see that somebody has programmed a computer to solve it!